Apple isn’t known for its web apps, though you can now access a lot of its core apps (in basic form) through iCloud on the web. It doesn’t include Apple Music, but Apple does make APIs available for the service that other programmers can hook into – and that means there are now several third-party online players for Apple Music. 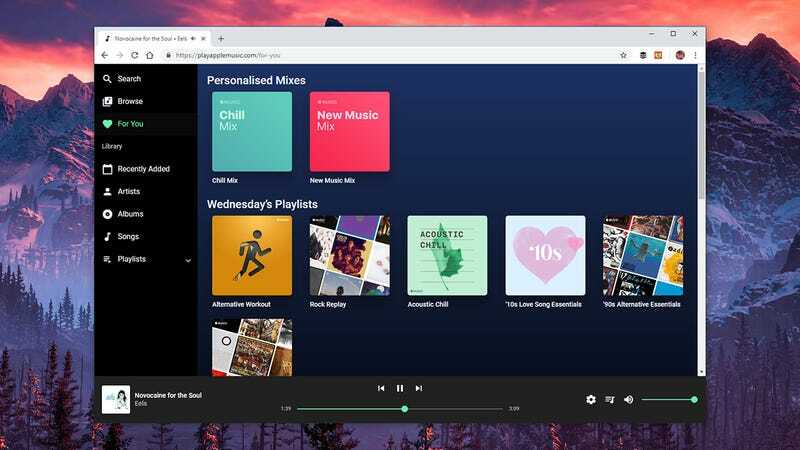 The newest entry into the field of Apple Music web players, Musish (which we discovered via 9to5Mac) will feel familiar if you’ve used Apple Music through iTunes or on mobile. There’s a lot of tasteful white space here, plus some handsome aesthetic touches – the mini player down in the lower left corner, the pop-up queue window, and so on. 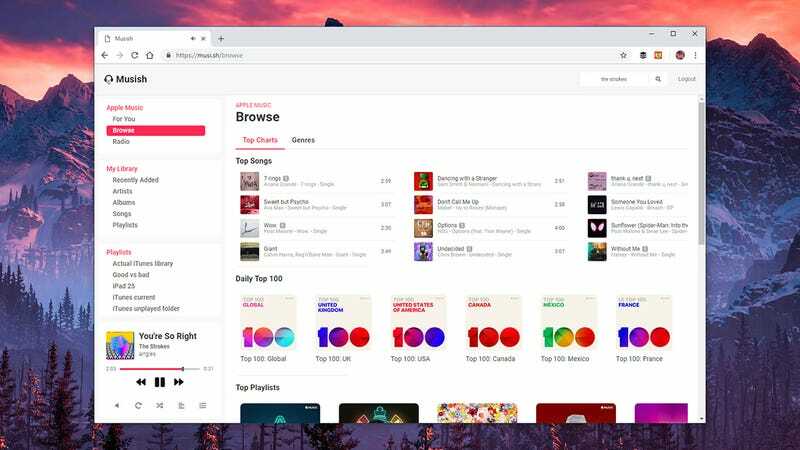 Artist pages, playlists, and search results appear full screen, but clicking on albums or singles brings up a pop-up window – click on any track to start listening or to shuffle through the entire list of songs. Volume, shuffle, and repeat are controlled via the mini player in the corner. What still needs work is playlist management: Your existing playlists show up, but you can’t create new ones (as far as I can see). 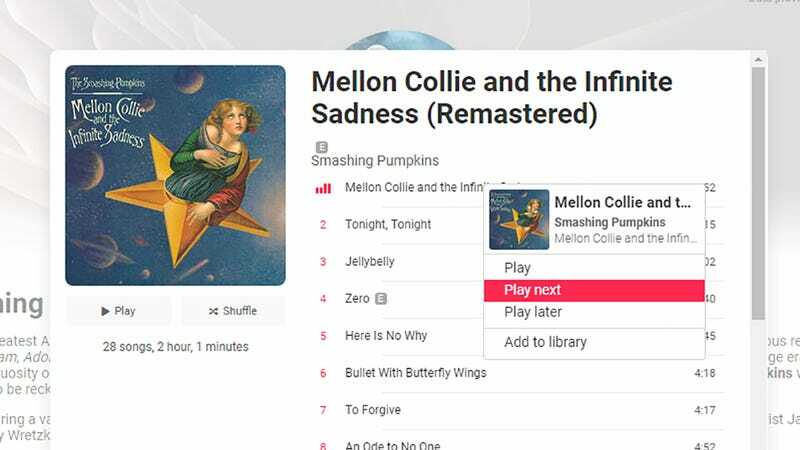 Adding new tracks, albums, or artists to a playlist isn’t particularly intuitive either – you can drag songs and albums from your library over to an existing playlist, but there’s no “add to playlist” option in the interface. As you would expect, a few features are missing – you don’t get the smart playlists or AirPlay options iTunes has, and there are no settings or customisations to speak of – but Musish is already very polished and will only get better over time, assuming of course that Apple is happy for third-party apps to carry on. Before Musish came Apple Music Player, which isn’t quite as easy on the eye as Musish but has all the same features and functionality. Its layout resembles Spotify with its long playback bar at the bottom (which I prefer, as elegant as a boxed-in mini player is). We’re perhaps unfairly leading with all the stuff Apple Music Player can’t do – it’s another very fast, very capable web client for Apple Music. Something it has over the Musish alternative is playback quality control: Click the cog icon in the playback bar to choose between the High (256 kbps) and Standard (64 kbps) options (handy if you’re on a metered connection). Despite the limitations of these web clients when compared with the mobile apps (not least a lack of support for offline playback), they’re still well worth bookmarking for any Apple Music user. They certainly load up a lot faster than iTunes does, which has to be a big point in their favour.